The official name of these bars is: God-Bless-America-Red-White-and-Blueberry Bars. This is a long name and may not be favored by all so I have shortened it to simply: red, white and blueberry bars. This name is just as explanatory, although, being made for the 4th of July the longer name is fun to repeat over and over at barbecues and parties. 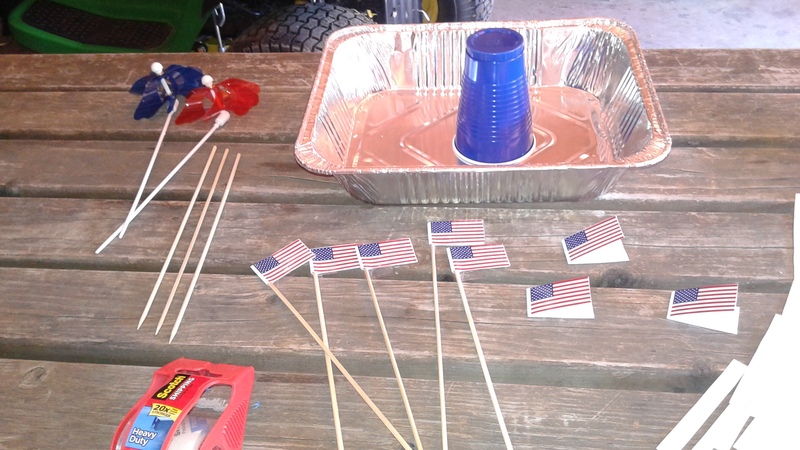 I made these bars on a hot afternoon on the 4th of July after watching the annual 4th of July parade. 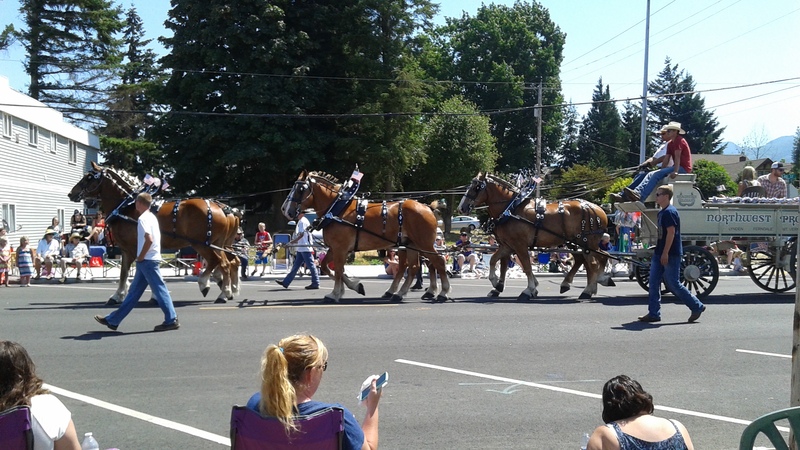 At the parade I saw draft horses, log trucks, tractors, old fire trucks, flags and tributes to fallen soldiers. Some of the fallen soldiers died young. Younger than me. 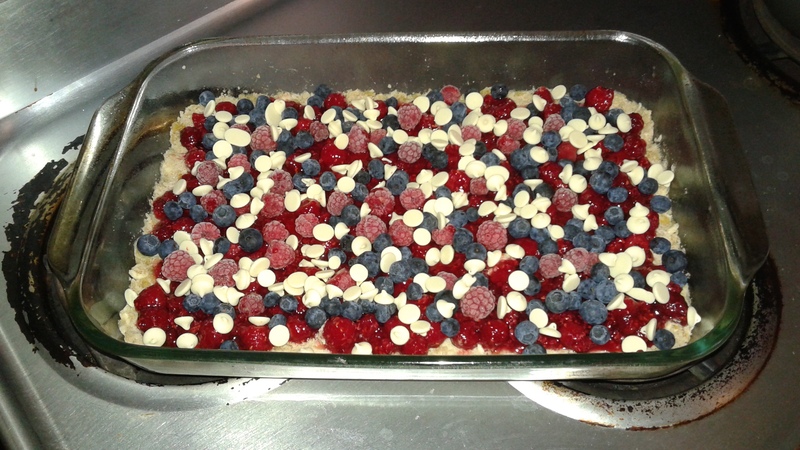 I get to live, watch the parade and make these berry bars for people to consume at parties while celebrating the independence of this country. 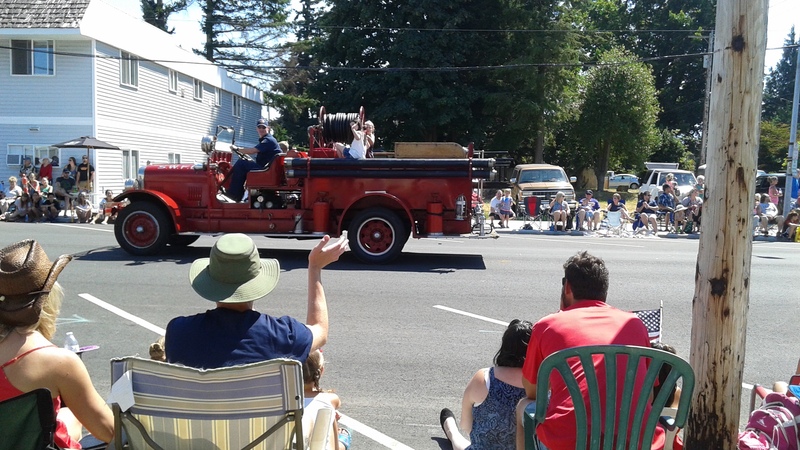 I’m glad I went to the parade. On the 4th of July we are celebrating more than drinking beer and shooting off fireworks. 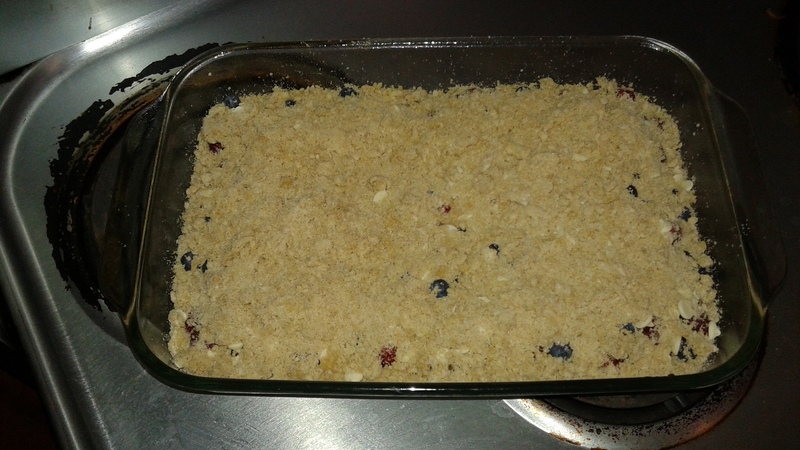 This recipe is adapted from a basic berry bar recipe found on allrecipes for blueberry crumb bars. I changed the sugar to include brown sugar and increased by 1/2 cup. I changed shortening (which I never use) to unsalted butter. I used cardamom instead on cinnamon in the crust/crumble. My only regret is that the red, white and blue is not clear in the finished product. I think when I make them again I will adjust for this and use less crumb topping. The bars are tasty, regardless. 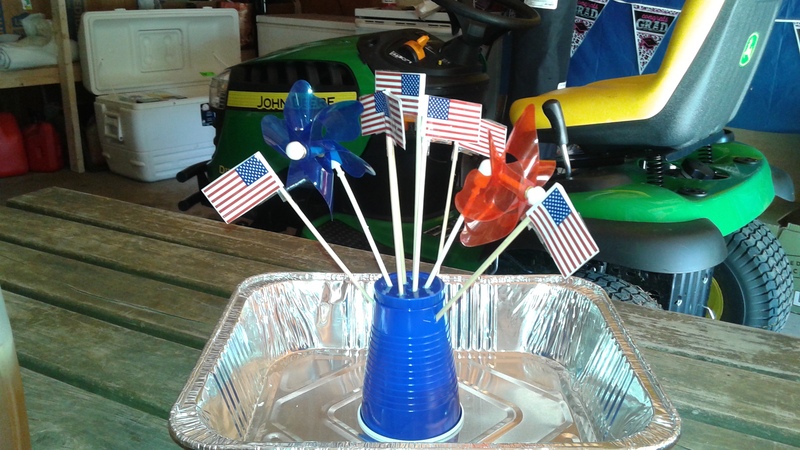 While the bars were cooling I did crafts in the garage to create a patriotic display including flags, pinwheels and a blue solo cup. I did this while the dogs were resting on the concrete in the garage. The dogs were hot and panting. Amazingly, I was drinking iced tea instead of beer for most of the afternoon. Stir together 1/2 cup sugar, 1 cup brown sugar, flour, baking powder, salt and cardamom. Cut in unsalted butter and egg with pastry blender. Dough will be crumbly. Pat in about 2/3 dough to prepared pan (9×13). Reserve the rest for the top. In another bowl mix together 1/2 cup sugar and 3 tsp corn starch. Add raspberries. When well mixed spread over crust. Add blueberries and white chocolate chips. (I also tossed in a few more frozen raspberries). Cover with remaining dough for crumb topping. Bake in preheated oven at 375 for about 45 minutes or until top is slightly brown. Check at 35 minutes. Cool before cutting into squares. Place in awesome display. Enjoy. 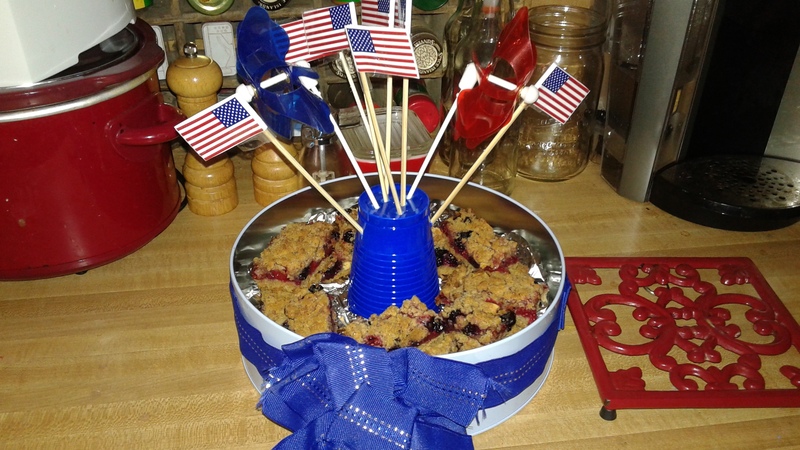 This entry was posted in food and recipes and tagged 4th of July, american flag, baking, berry bars, blueberries, dessert, independence day, parade, raspberries, recipe. Bookmark the permalink.